Pioneers in the industry, we offer rotogravure printing machine, 7 motor rotogravure printing machine, bopp rotogravure printing machine and fully automatic rotogravure printing machine from India. 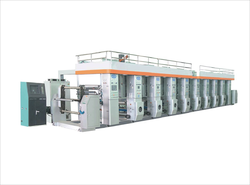 We feel immensely pleased to offer an exclusive gamut of Rotogravure Printing Machine. Our offered machine is manufactured by utilizing best quality raw material and advanced technology by our vendors’ skilled professionals. In order to make sure quality, the offered machine is rigorously tested on different parameters. In tune with industry standard, we provide the entire range in different sizes and designs, as per the ever-evolving requirement of our clients. We are offering our customers a wide range of Rotogravure Printing Machine. We are offering our customers a wide range of Rotogravure Printing Machine. Our offered machine is manufactured by utilizing best quality raw material and advanced technology by our vendors’ skilled professionals. We are offering our customers a wide range of Rotogravure Printing Machine. It is manufactured using quality raw materials and latest technology.